Healthy work environments are all about balance. But it can be easy to forget that, in and out of the workplace, human emotions come into play. 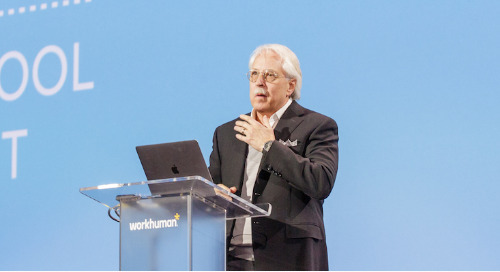 At Workhuman 2019 in Nashville, an entire content track was devoted to the complexities of navigating employee emotions at work, from unexpected trauma to internal team conflict. The sessions ran into a few dichotomies because often, you need a little of both – conflict and harmony, professionalism and vulnerability – to nurture a balanced and supportive environment for employees to thrive. Can we be vulnerable and professional? When it comes to trauma in the workplace, HR often struggles to balance professionalism, confidentiality, and support for their employees. As a culture, Americans struggle in dealing with grief. “We deny it and we don’t talk about it,” said Jennifer Crow, grief and trauma response consultant at Crow J Consulting. In a session titled “When a Co-worker Dies: A Case Study on Grief Response in the Workplace,” Jennifer and Stephanie Blakey, senior HR business partner at The Cadmus Group demonstrate that when it comes to grief response in the workplace, there is a legitimate business case for making sure it’s handled effectively. Traumatic life events can be devastating to both the employees involved and the company as a whole. But when employees feel supported by their companies, they are more likely to take advantage of resources to feel better. When employees feel supported by their companies, they are more likely to take advantage of resources to feel better. There is a health connection to grief, too – grief lowers the immune system, so in the long run, Stephanie and Jennifer point out, employees take fewer PTO days if trauma is handled well from the beginning. What’s more is that when employees feel their company cares, retention and loyalty rise. And these principles apply when dealing with medical conditions, as well, said Mary Faulkner, talent strategist and co-chair at DisruptHR Denver, in her talk titled “It’s All Fun and Games Until Someone Has a Medical Condition.” Ninety-six percent of people with chronic medical conditions live with an illness that is invisible. One of the most common types of disability covered under the Americans with Disabilities Act, for example, is a psychiatric disability such as anxiety, depression, attention-deficit disorder (ADHD), or bipolar disorder. Businesses: Review policies to remove the stigma from taking time off, ensure employees know that their privacy is safe, and educate staff on how to support their direct reports. Managers: You don’t have to be an expert on everything – ask for help! And maintain appropriate boundaries while being human. This means meeting employees where they’re at and giving them what they need, not what you need. Employees: Know your rights and share only what you’re comfortable sharing. Can a harmonious workplace have conflict? “Let’s take this offline.” It’s a phrase commonly heard in the meeting room, and it’s often well-intentioned. Let’s stay on topic, it means, and let’s avoid a conflict in the meeting. According to Liane Davey, Ph.D., best-selling author, and co-founder of 3COze, this is how we accumulate conflict debt in the workplace. In Liane’s session, “The Good Fight: Why Embracing Productive Conflict Will Strengthen Your Team and Grow Your Bottom Line,” she explained why organizations require conflict and tension between opposing forces. Just like credit card debt, conflict debt compounds when we fail to address the issue. And it’s only human – disagreeing with other people shows up in our brain exactly like physical pain. We don’t want to offend people, hurt feelings, or be alienated. So we avoid. The cost of conflict debt is especially high for leaders. When leaders don’t force a difficult conversation – particularly about prioritizing what is most valuable to the business and where to devote resources – the conflict debt ends up getting paid by someone with less context and responsibility. When a leader can’t make the call about what matters most, employees either get burned out trying to do it all, or they decide for themselves. “Avoiding conflict doesn’t make it go away, or make our workplace happier or more engaged,” said Liane. “It redirects it and embeds it in our organizations.” And the impact can be felt down to the team level. When teams can’t address a conflict between team members, trust erodes, and both productivity and morale take a hit. "Avoiding conflict doesn't make it go away, or make out workplace happier or more engaged." “It’s not just a skills gap, it’s a mindset gap. We need a new metaphor,” Liane continued, referring to the famous motivational “teamwork” poster often seen in office hallways, depicting a rowing team moving in synchrony. Focusing too much on teamwork can make employees feel dissent and diversity of thought is looked down on – and they will be less inclined to speak up, for fear of rocking the boat. By learning the unique skills and perspectives each employee brings to the workplace, teamwork can mean a balance between the various (and important) roles each employee plays.